Synthetic peptide conjugated to KLH derived from within residues 1 - 100 of Mouse Doublecortin, phosphorylated at S28. 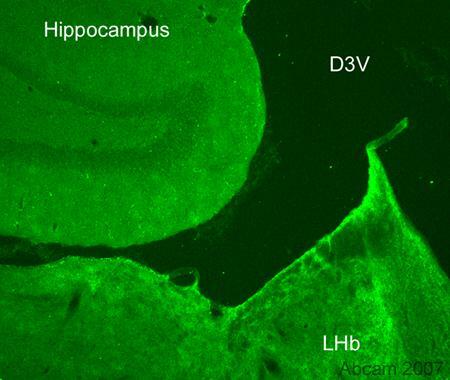 Mouse Adult Brain Whole Tissue Lysate and Mouse (0-days old) Brain Whole Tissue Lysate. Rat adult brain tissue. Our Abpromise guarantee covers the use of ab23544 in the following tested applications. Immunofluorescent staining for Doublecortin (phospho S28) in the rat habenular nucleus using Rabbit polyclonal to Doublecortin (phospho S28). 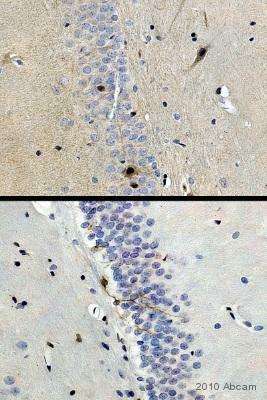 The staining pattern observed with ab23544 appears to be specific, however, the staining is not very strong or contrasted - this might be expected for detection of a modification protein in unstimulated tissue. Protocol details: Rats were intracardially perfused with 4% paraformaldehyde. 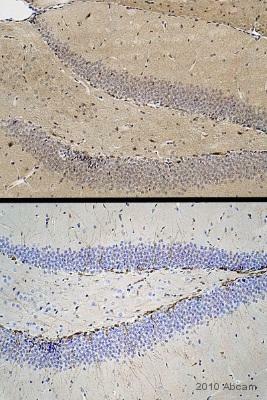 Whole brain tissue was post-fixed overnight in the same fixative, and cryoprotected in 20% sucrose and frozen in OCT. 30µm coronal sections were cut by cyrostat for use in free floating IHC. Primary antibody ab123544 was incubated overnight at 1/1000 at room temperature. Secondary antibody Alexa fluor 488 1/1000 was incubated for 2 hours at room temperature.